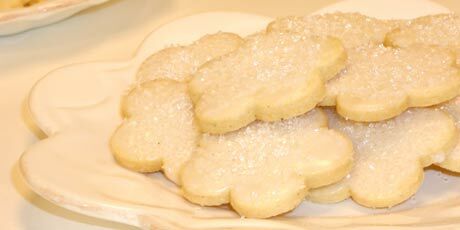 For a more elegant presentation, these sugar cookies can be glazed and sprinkled with coarse white sugar. 1. Beat butter and sugar together by hand or in a mixer, until pale and fluffy. Blend in egg and vanilla extract. In a separate bowl, stir together flour, cardamom and salt. Stir into butter mixture until just combined. Gather dough together, shape into 2 discs, wrap and chill until firm, about 1 to 2 hours, or freeze until ready to use (then thaw overnight in fridge). 2. Preheat oven to 325° F. On a lightly floured work surface, roll out first disc of dough to just less than ¼-inch thick. Cut out desired shapes and lift with a spatula onto a parchment-lined baking sheet. Roll second disc, saving all scraps to re-roll for more cut-outs. If you choose, add sprinkles or other decorations onto cookies before baking. Bake for 12 to 15 minutes, until edges of cookies just begin to brown. Let cool before removing from tray. 3. Cookies will keep in an airtight container for up to 2 weeks. 4. Yield: 2 to 3 dozen cookies. 5. VARIATION: Glazed Cardamom Sugar Cookies -- Glaze recipe follows. 1. For glaze, combine icing sugar and milk and whisk until smooth. Brush cookies with glaze and allow to dry on cooling rack for 1 hour.